Little do you realise, when you first fold a sheet of paper, just how far this skill can go! I am not going to try to convert you to being a master at origami, or a talented paper artist, but I do want you to be inspired and to realise how interesting and creative the ‘simple’ art of paper folding can be. 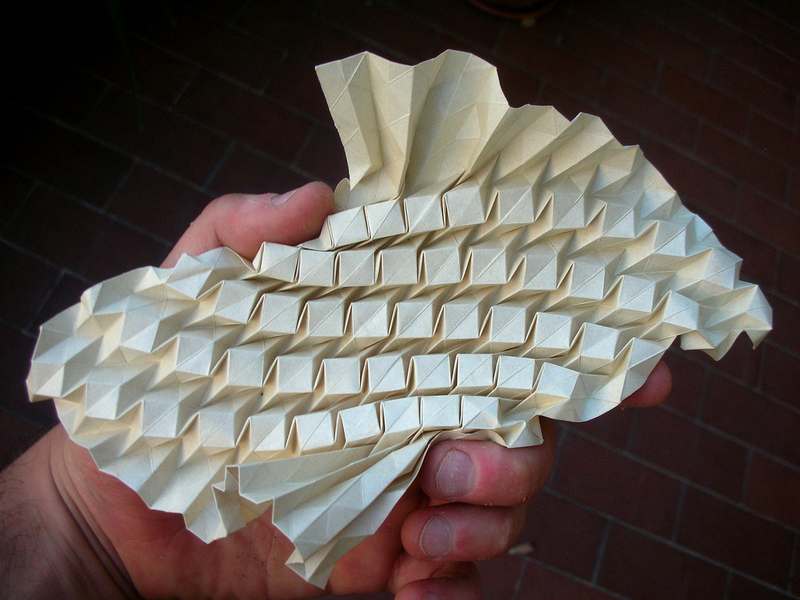 There are many wonderful origami and artistic/architectural paper folding sites on the Internet, but let me encourage you to browse through images of Andrea Russo’s work. You might also like to visit his Flickr page and a selection of his work on Pinterest as well! He produces such brilliant work, much of which I would be more than happy to have on display in my home … and I hope you would, too. The moment children start folding paper, they begin to learn and explore the notions of sides, of symmetry, of repeatability (iterations), of parity, and of reversibility (inverse operations) … and there are, no doubt, more things that I have not thought of. Tying knots is a related skill, and skills such as knitting and macrame are, basically, ‘knot tying’ taken to a very high level indeed. Every time you use knots for knitting, sewing, all forms of weaving, fishing, mountaineering, camping, etc. you are using mathematical skills. What child has not made a paper aeroplane? I think, wherever there has been access to paper, such things have been made. Perhaps, even in ancient Egypt, people who could afford papyrus experimented with making the sheets fly. When I was at university, engineering students were (in)famous for using tiered lecture rooms to test out an incredible variety of paper aircraft and their flying properties! I heard that some managed to make extraordinarily large gliders from double spreads of our largest newspapers, and that other were able to create aircraft that launched other aircraft during their gentle glide to the front of the lecture theatre. Nowadays, making and flying paper planes has become a highly competitive skill. You will find numerous websites and YouTube videos devoted to such things. Some of them provide quite good templates or instructions as well. On 26 February 2012, a new world distance record was set for level paper plane flight. Former college football quarterback Joe Ayoob threw a paper plane 226 feet, 10 inches (about 63.35 metres)! It flew almost the entire length of the hangar at McLellan Air Force Base near Sacramento, California (which is way over half the length of a football field!). Watch the video of this world-record-breaking event! The plane, however, was not folded or constructed by him. Joe Ayoob had the throwing skills, of course. The plane building skills, however, belonged to John Collins who has a YouTube channel devoted to sharing his very obvious talents and experience. He is known on YouTube as Paper Airplane Guy (what else? ), so I encourage you to watch some of his videos and experiment with his designs. Make some planes and use different materials and see what you can do! Have a competition with friends. Some people build gliders and throw them from high points to see how far they will fly. Especially in urban areas there are lots of opportunities for a plane to rise in thermals and updrafts next to buildings. Some people on YouTube are claiming flight times of over nine minutes (which is entirely plausible in that environment) and I have seen continuously filmed flights of over three minutes! Indoors, the world record is currently 29.2 seconds (held by Takuo Toda from Japan). Now, before I sign off, I have three more things to share (and one of them involves a challenge!). First, I want you to notice how careful John Collins and others are. 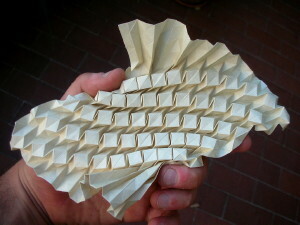 They strive to be neat and are careful about making very precise folds. This is because having your plane even a tiny bit lop-sided can make a big difference in how it flies! Second, many years ago I learned to fly a wooden ruler by throwing it parallel to the ground (and to the line of flight), and spinning it backwards with my fingers as it left my hand. It made a nice whirring sound (like a bull-roarer). Years later, I saw someone fly a 'gliding wing' (which flies in much the same way) and I was entranced. The video below is of John Collins making and flying one of my favourite paper aircraft. Try to make your own and let me know if you can manage to fly it the length of your house. If you listen carefully to John Collins' instructions (about how to make a gliding wing) you will find that he uses fractions quite a lot! Finally, I wish to record a big thank you to Mr Hutley, my Fourth Grade teacher for making our lessons interesting. I still remember that some lessons were set aside over a few days to cut out, assemble and glue paper aircraft. When they were dry, we had more time set aside to have a flying competition in the classroom, to see whose plane could fly the furthest. It was fun to see our own planes fly. Such good lessons are not forgotten. I also learned the value of neat and careful work! Thank you, Mr Hutley.